ATHENS – To say the Grapeland Sandies are on a roll would be an understatement. Since District 12-2A DII play began the Sandies have only yielded 67 points, with five shutouts. They are on a 10-game winning streak and their offense is clicking on all cylinders. 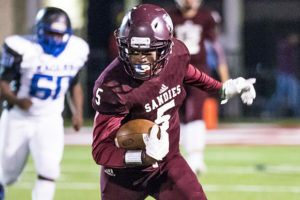 When the Detroit Eagles stepped on to the turf at Bruce Field in Athens to battle the Sandies for the Area Championship, it seemed as if they were unaware of the buzz saw that awaited. 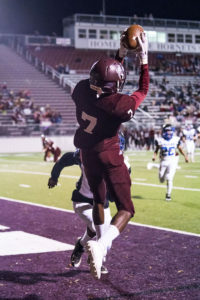 Grapeland’s first play from scrimmage, however, served as both a hello and goodbye call for the Eagles as Rick Frauenberger found Tyrin Wiley all alone in the secondary for a quick-strike 52-yard TD. The extra point attempt was no good but with only nine seconds gone in the game, Grapeland seized an early 6-0 lead and never looked back on their way to a 60-0 win. Detroit’s first possession ended in disaster as Wiley picked off an errant throw and returned the ball to the Eagles’ 45. From there, Frauenberger and Josh “Bear” Ackley began to carve up the Detroit defense. After a Frauenberger incompletion, Ackley picked up three. Following an illegal procedure call, Frauenberger and Ackley teamed up on back-to-back receptions which moved the ball inside the Eagles’ red zone. Ackley then bulled his way for 14 yards to move the ball to the five. The Sandies changed gears at this point as Frauenberger connected with BJ Lamb for a five yard TD and a successful two-point conversion which put Grapeland ahead by a score of 14-0, with 6:49 left to play in the opening period. The Eagles set up shop on their own 37 following the kick and once again, the Grapeland defense kept Detroit in check, forcing a punt. The Sandies took over on their own 32 and on first down, Ackley hauled in a 16 yard reception from Frauenberger. Then, Frauenberger found Javion Joseph for 21 yards which was followed by a six-yard Ackley run. On second and four, Frauenberger and Joseph hooked up again for a spectacular 24-yard juggling, TD catch. The extra point by Ackley was good and with 2:55 left in the first quarter, the Sandies now led 21-0. The Eagles’ next possession started at their own 25 only to go backwards, forcing a punt. The Sandies took over at their own 42 and on first down, Frauenberger threw deep for Lamb who hauled in the pass for a 58-yard touchdown. The try for two was no good but the Sandies had stretched their lead to 27-0 with 22 seconds still left in the first quarter. Following yet another three and out by Detroit, Grapeland went on a relatively, short drive from the Eagles’ 42. Ackley picked up 14 yards on two carries while Cadarian Wiley rumbled for 14 more to move the ball to the 14. An illegal procedure call on Grapeland was followed by a pass interference call on Detroit which moved the ball to the nine. After back-to-back incompletions, Frauenberger found T. Wiley in the end zone for six points to push the Grapeland lead to 33-0, with 8:04 left in the half. Following a turnover on downs, the Sandies took over with 6:07 left in the half at their own 23. A 77-yard TD pass to Joseph was negated by offsetting penalties, but Frauenberger was able to get most of it back when he connected with T. Wiley for 65 yards, down to the 12. From there, Ackley took it the rest of the way for a score, as well as the extra point to make the score 40-0. The Eagles attempted to make one last push before halftime and actually made it inside the Grapeland red zone. 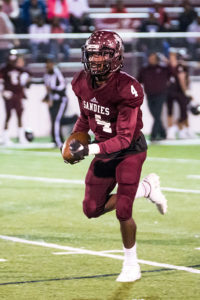 An incompletion, however, along with a big hit from T. Wiley to separate a Detroit receiver from the ball brought the first half to a close with the Sandies up by 40. After the break, Grapeland began to milk the clock and didn’t score again until the 2:36 mark of the third when C. Wiley bulled his way over the goal line from two yards out – after a 46-yard carry – to make the score 46-0. As the third quarter was winding down, T. Wiley picked off another errant Eagle pass at the 42 yard line and returned the ball down to the two-yard line as time expired in the period. On the next play from scrimmage, Ackley walked into the end zone untouched, added a two-point conversion and made the score 54-0. A 34-yard touchdown, at the 4:08 mark of the fourth – by Javacia Shepherd – closed the scoring and sealed the 60-0 victory for the Sandies. 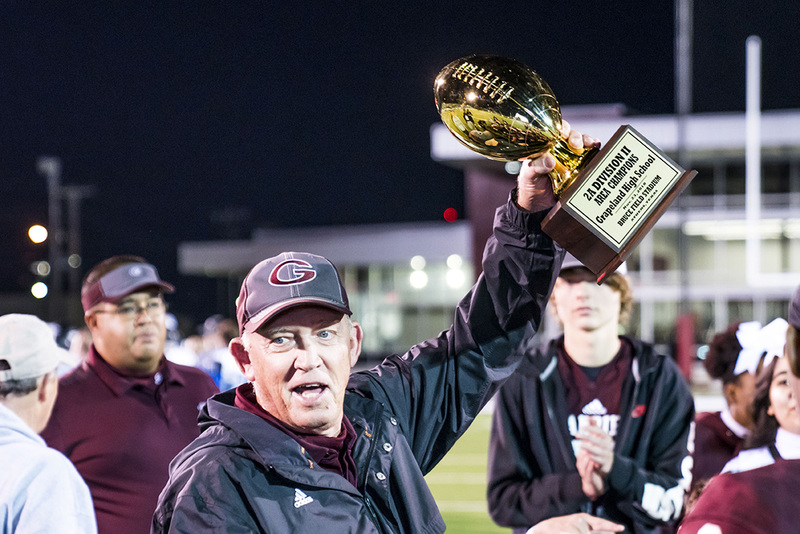 Following the game, Grapeland AD/Head Coach Wayne Mahaffey spoke about his team’s win. In regard to the Sandie defense which has not given up a point in 10 quarters, Mahaffey said the players understand their assignments and executed them to the best of their ability. “If we hang up some more zeroes next week, then we’ll have something to talk about,” the coach said with a smile. The win gives the Sandies the Area Championship for the second year in a row. It also sets up a showdown with the #1 ranked Mart Panthers on Friday, Nov. 30. 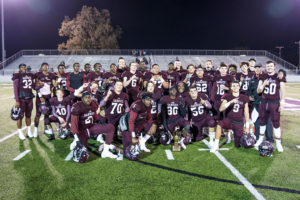 The game will be held at the Madisonville Mustangs Stadium in Madisonville. Kickoff is scheduled for 7 p.m.